Jester King Bonnie the Rare, originally uploaded by adambarhan. A: pours a golden yellow in color with pale yellow highlights and a nice thin head which left some good lacing sticking to the glass. S: funky earhty with spice was noticeable upfront on the aroma with apple, slight pear but with grainy notes and a little tart astringent qualities. T: the tart character was more prominent on the palate alongside toasty grains, apple fruitiness, some spice, citrusy accents a touch of bretty funkiness. M: the brew was medium in body with a good amount of carbonation which had a funky, mild fruity, spice, grainy, tart and slight dry finish. O: definitely one of the better offerings from JesterKing but still needs some work. 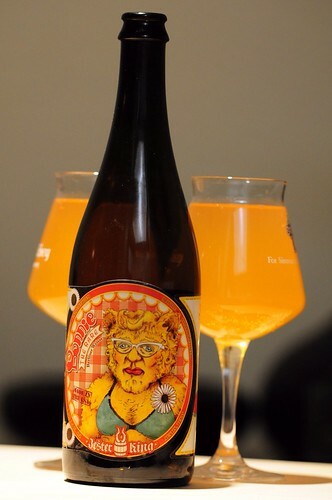 Beer, Bonnie the Rare, Craft Beer, Jester King Bonnie the Rare, Jester King Brewing Co.